In the seventies, Marvel Comics entered the comic magazine field pioneered by Jim Warren, releasing a flood of titles that included Monsters Unleashed, Tales of the Zombie, Dracula Lives!, and The Haunt of Horror. 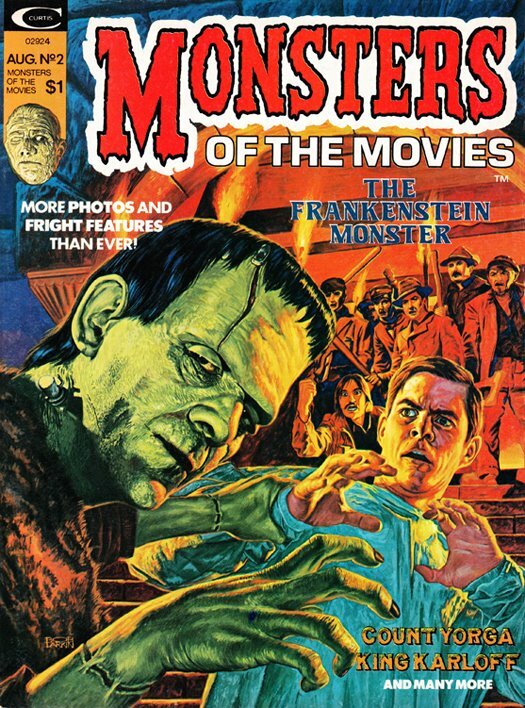 In 1974, Monsters of the Movies was a latecomer in the movie monster magazine sweepstakes. The editorial staff reads like a who’s who of comics, with Roy Thomas as Editor-in-Chief, East Coast Editor Tony Isabella, Consulting Editor Marv Wolfman, and Art Director John Romita. Monster movie experts Jim Harmon (serving as West Coast Editor), Don Glut and Ron Haydock were contributors. Looking back, Monsters of the Movies, well written and informative, stands up as one of the better entries in a crowded field, though at the time it felt somewhat anachronistic, as it went over the same old school horror films that had already been covered extensively by Famous Monsters and countless other titles for almost 20 years. There were nine issues published on a brisk, bi-monthly schedule. The last issue was pitched as “Annual No.1”. The issue at hand, No. 2 from August 1974 carries a number of Frankenstein-related articles, the most intriguing — and frustrating — being a short interview with veteran stuntman George DeNormand entitled “The Last of the Frankensteins”. DeNormand recalls doubling for Boris Karloff in a film directed by “Jimmy Whale”, and being made up as the Frankenstein Monster by Jack Pierce’s assistant, Otto Lederer. DeNormand not only suffers from fuzzy recall, he is also unforthcoming, suggesting he has “unusual” and “unbelievable” stories to tell — about working with Karloff and doubling for Henry Hull in The Werewolf of London (1935) — but holding back because he’s saving them for a biography to be titled Making of a Stuntman. Unfortunately, Mr. DeNormand passed away within two years of this interview, taking his stories with him. The issue’s striking cover was painted by the highly prolific Bob Larkin, the go-to guy for Marvel’s magazine line. Larkin also worked for Warren publications, and produced hundreds of paintings for magazines, comic books and trading cards. Along the way, he contributed vivid art for such titles as Planet of the Apes, Doc Savage, Star Trek, Battlestar Galactica and Babylon 5. Here, bathed in vivid firelight, a greenish, scaly-faced Karloff Monster, wearing his Son of Frankenstein furs, poses menacingly while grabbing a cowering Colin Clive-type mad scientist. Torch-bearing villagers look on. Look at the center of the painting. A furious, destroy-the-monster villager waives a fist. 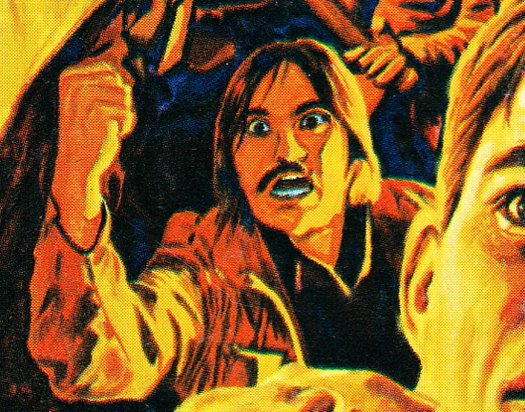 I hadn’t noticed in all the years since I bought this issue off a newsstand, perhaps some distance was necessary, but this villager — with long hair and mustache — looks contemporary to the magazine. He doesn’t quite fit in with the forties Hollywood Tyrolean mob, does he? The Man in the Middle is Charlie Armentano, a neighbor of Larkin’s who posed for dozens of covers in the early seventies. So there you have it, the method to Larkin’s strong, memorable cover: Reference some Frankenstein movie stills, enlist an enthusiastic model, compose a narrative, and illuminate with blazing colors. The result is a painting that glows like a stained glass window and pulsates with pulp magazine energy. See the entire run of covers for Monster of the Movies here. Someone uploaded the George DeNormand interview on Flickr. I wish there was a Bob Larkin website. Here’s a glimpse of his work, otherwise you have to google his name to see some of his fabulous art. I recommend Rob Kelly’s excellent blog All in Black & White for 75 Cents for extensive coverage of the Warren, Marvel and Skywald type of black and white magazines of the seventies. Funny... I bet alot of artists worked their friends into mob scenes and stuff like that. I seem to recall reading at some point that part of the reason its plug got pulled, was staff at home in Marvel East being jealous of the fact that this was largely being done by West Coast guys. i'd buy that one just for the cover if i saw it.